Arrival Delhi Railway Station/Airport - drive to Hardwar- drive to Hardwar transfer to your Hotel. 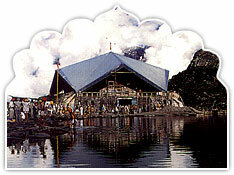 Visit Har-ki-Pauri for Ganga Aarti in evening. Bqack to your hotel, Dinner & Night halt. Morning, drive straight to Joshimath enroute visit Deoprayag, Rudraprayag - Check in Hotel. Overnight stay. Morning visit Narsingh Temple & Shankracharaya Math. Later drive to Badrinath, Check in Hotel. 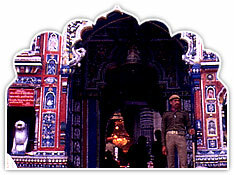 Visit Badrinath Temple for evening Aarti. Night halt at Badrinath. Early morning, pilgrims after having a bath in the Taptkund have the Darshan of Badrivishal. Brahamakamal is significant for Pinddan Shraddh of ancestors (Pitrus). There are other interesting sight seeing spot like Mana, Vyas Gufa, Maatamoorti, Charanpaduka, Bhimkund and the "Mukh" of the Saraswati River. Just within the three kms of Badrinathjee. Later drive back to Rudraprayag. Check in Hotel. Overnight stay. Drive to Hardwar, enroute visit Rishikesh Local Sight Seeing (Ram Jhulla, Laxman Jhulla, Triveni Ghat, Parmarth Niketan, Shivananda Ashram & Gita Kutir). Arr. Haridwar, transfer to Hotel. Night halt. Morning visit Hardwar Local Sight Seeing. Later dep. to Delhi. On Arr. Delhi, Drop at Railway Station/Airport. (i) Accommodation on twin sharing basis deluxe hotels / GMVN Tourist Bungalows . (iii) Vegetarian food as described in itinerary. KUMAON MANDAL VIKAS NIGAM LTD.
GARHWAL MANDAL VIKAS NIGAM LTD.